WEST HARTFORD, CT- The Hartford Hawks and Maine Black Bears tipped off in an America East contest at the Chase Family Arena on the U of H campus Monday night before a fairly good crowd. The Hawks would pull out to a quick lead and never look back on their way to a 76-39 victory. Three point shots were part the winning equation for Hartford as they hit 9 on the night, producing 27 points, which was just 12 less than Maine’s entire point total for the evening. The game was close early on as Hartford led 10-7, thanks to Erica Beverly’s basket and the foul, a shot which she made. One of their many three pointers followed later but the hard charging Kristin Baker scored for Maine to keep things at 13-9, but Diana Delva drove to the hoop and scored to make it 15-9, and soon afterward Mary Silvia drained a three to make the lead 18-9. On an ensuing play Hartford stole the ball, Maine stole it back, then Hartford stole it back again. Hartford tried to set up a shot but time was running out, all the same Daphne Elliot put up a three and it sailed in as time ran out, to make the score 21-9. Not long from then each side would pick up two points to make it 23-11. At this point Hartford had 2 fouls to Maine’s 5. Not long after that Hartford continued to search for a shot and time went down but Ruthanne Doherty hit the three as the buzzer sounded to take a 26-11 lead. During a scrum in the Hartford end, the ball came lose and rolled along the floor, Jackie Smith scooped it up and it ended up in the hands of Ilicia Mathis who hit yet another 3, and the score was 29-11 with about 8 to play. Soon afterward another 3 point shot missed, but Delva rebounded and scored. 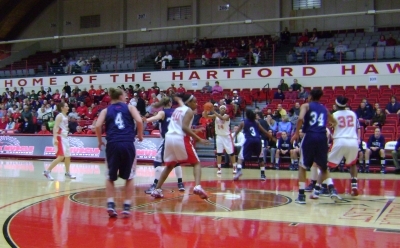 A foul on Hartford led to two free throws for Maine but the score was still 31-13. Not long after that Doherty scored from in the paint. Katelyn Vanderhoff stole the ball for Maine later on, but on the ensuing attack, a Hartford player came up with the block. Maine had been going an extremely long time without scoring a field goal, but finally after a Kristin Baker steal, Samantha Wheeler received a pass and put it in, the score was 33-15. Katia Bratishko would also get a good a pass and score as well, but Beverly fought her way close in to score and kept the lead at 35-17. She then followed it soon afterward with a fadeaway jumper from close range. Some mistakes on Maine’s part in passing as well as a potent Hawk 3 point attack really must have contributed to Hartford’s lead. By games end 6 different U of H players would have a three pointer to their name. In the second half play would resume, though Hartford would add 31 points, and Maine mustered only 17. Delva and Beverly kept at it with their scoring early on and it was soon 56-26 with about 15 minutes left. Maine did keep up their own attack including a play in which Baker stole it, passed it off, got the pass back and easily laid it in, but they were still down 30. Baker picked up another steal later and scored but it was 60-30 at that point as well. Silvia then nailed an open 3. Vanderhoff responded with 2 under time pressure, and Wheeler added 2 as well but it was 63-34 with less than 10 to play. Beverly scored again and then came up with a block moments later. Maine picked up a few more points off a fouls and a 2 pointer from close to the arc line, but the game was far out of reach. Briana Winston who only played 4 minutes for the Hawks, even nailed an open 3 in the closing minutes, and before long the horn was sounding signaling the 76-39 win was solidified. Hartford now has a 7 game winning streak including a 5 game America East winning streak. They are 14-3 with their only losses coming to Providence, Marist, and Connecticut. Maine falls to 5-13 on the season and 1-5 in the conference.